Layering coordinated patterned papers is an effective technique for showing off your photos. In this layout, Barbara shows us how to do just that. This layout was created using papers from the Chatterbox Chateau Room collection (Chateau Meadowlark Paper, Chateau Sky Floral Quilt Paper and Chateau Mantle Stripe Paper), green cardstock, ink, white brads, blue flowers, photo corners and chipboard letters. Use your green cardstock for the background. Cut a piece of Chateau Sky Floral Quilt Paper measuring 7.5cm x 13cm and lightly ink around the edges. Adhere in the top left-hand corner. Next, cut a piece of Chateau Meadowlark Paper measuring 8cm x 10.5cm and lightly ink around the edges. Adhere to the top right-hand side. Cut a piece of Chateau Sky Floral Quilt Paper measuring 6.5cm x 16cm and lightly ink around the edges. Adhere to the bottom right-hand side. Then cut a piece of Chateau Meadowlark Paper measuring 24.5cm x 10cm and lightly ink around the edges. Place towards the bottom left-hand corner, as shown in the layout. Cut a piece of Chateau Mantle Stripe Paper measuring 22cm x 18.5cm, folding over the top right-hand corner and securing with a white brad. Lightly ink around the edges and adhere to your page as shown in the layout above. 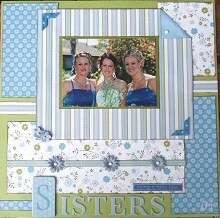 Mat your photo with green cardstock and centre on the striped piece. Cut a stripe from the Chateau Mantle Stripe Paper measuring 11cm x 1.5cm. Cut in half lengthwise and place on the green cardstock on both sides of the striped photo mat. Cut a thinner stripe approximately 24.5cm from the Chateau Mantle Stripe Paper and place it across the Chateau Meadowlark Paper. Secure it with three blue flowers and three white brads. Finish off the page by embellishing with small blue flowers, chipboard letters for the title and chipboard alphabets and photo corners.